This salad is easily one of my family's favorites, and since I can whip it up in less than half an hour, it makes a perfect weeknight dinner. It's packed with flavor and texture, from the balsamic-infused roasted veggies to the light, crispy goat cheese cakes. A generous squeeze of fresh lemon juice brightens up the whole dish. Preheat oven to 350°. Toss zucchini, tomato, onion, and garlic together in a shallow baking dish, then sprinkle oil and vinegar over them and toss again to coat. Season to taste with salt and pepper, and roast for 10-15 minutes. While the veggies are roasting, cut goat cheese into ½-inch thick rounds. Dredge first in flour, then beaten egg, then panko bread crumbs. Heat the oil in a skillet on medium heat, and add coated goat cheese rounds. Let brown, then flip to brown the other side. Remove from skillet and drain on paper towels. 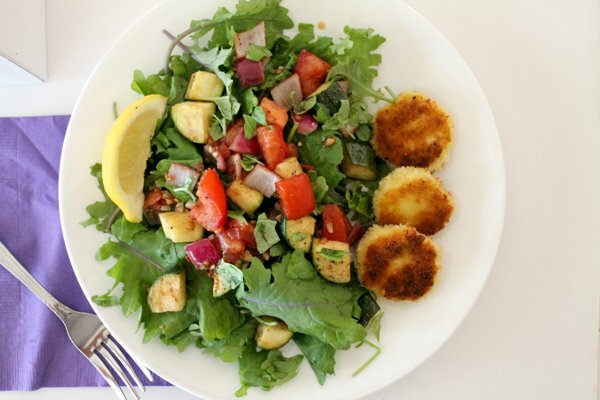 To serve, plate the salad greens, then top with warm roasted vegetables. If you have fresh basil on hand, tear up several leaves and sprinkle over the salad. 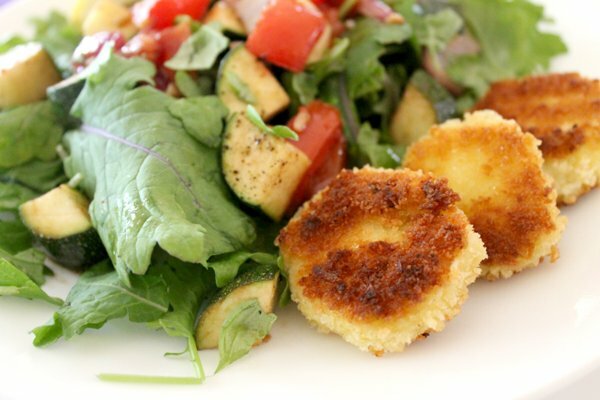 Place the goat cheese cakes alongside the salad, and serve with lemon wedges.